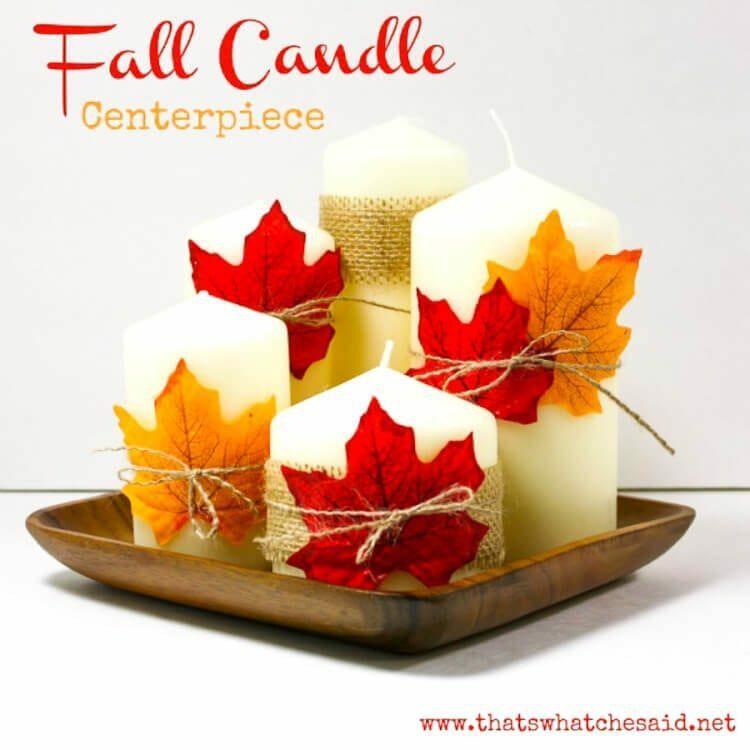 Because of everything centers around the table at Thanksgiving, a good centerpiece is a key to whether your Thanksgiving will be one for the ages or a disaster. Just kidding. 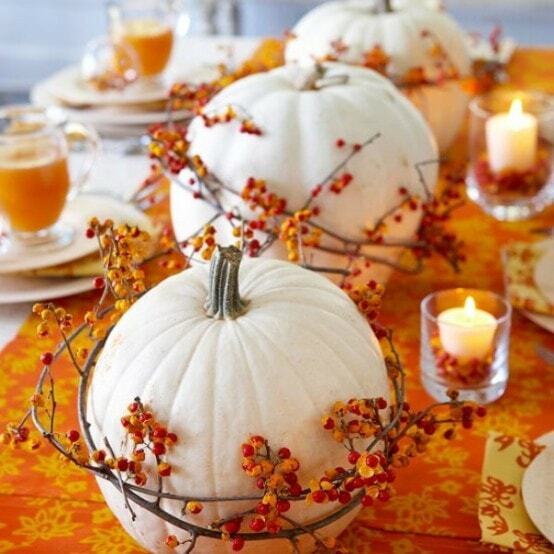 But in reality, Thanksgiving centerpieces can make or break your holiday ensemble. 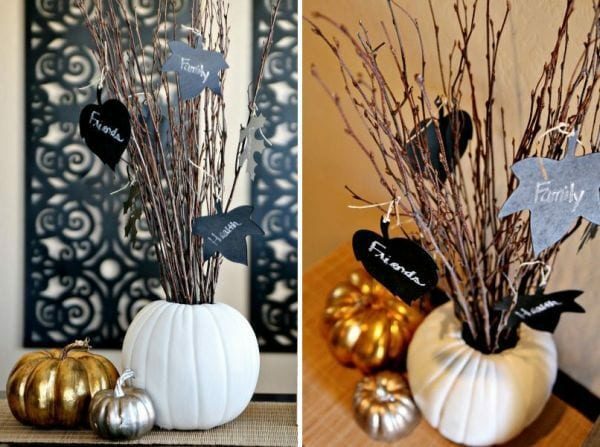 The DIY Thanksgiving centerpieces below may spark some ideas that fit your home and table style. 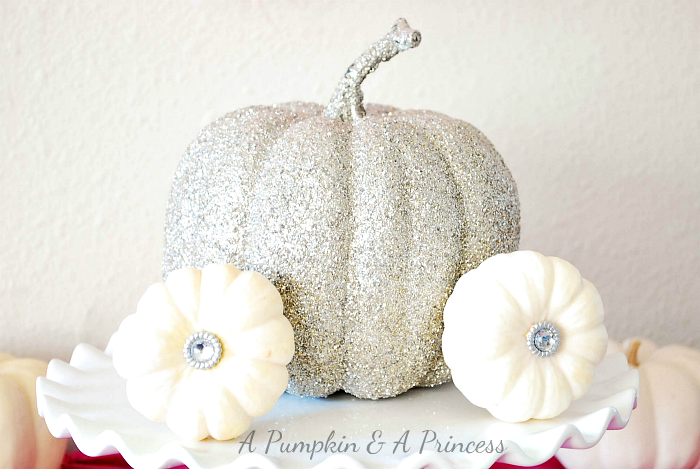 Put some glitz and glamour in your Thanksgiving centerpiece with these cute glitter pumpkins. 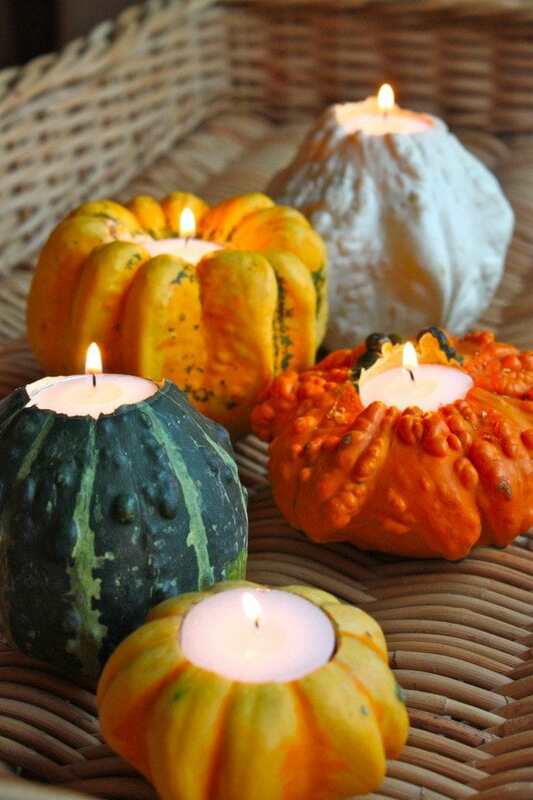 There are plenty of ways to glam-up your decorative gourds and pumpkins, and they can bring a nice light, bright touch to the table without being over the top. If there’s one thing we know about pumpkins and gourds, it’s that you can put things in them. Candles. Sticks. Flowers. The list is endless, but we’ll stop there. 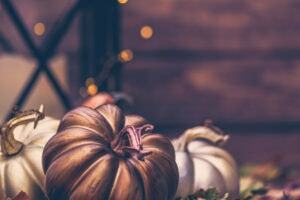 These pumpkin vases can help you combine multiple fall elements into one beautiful centerpiece. Add fake moss or other natural elements to round the whole thing out. 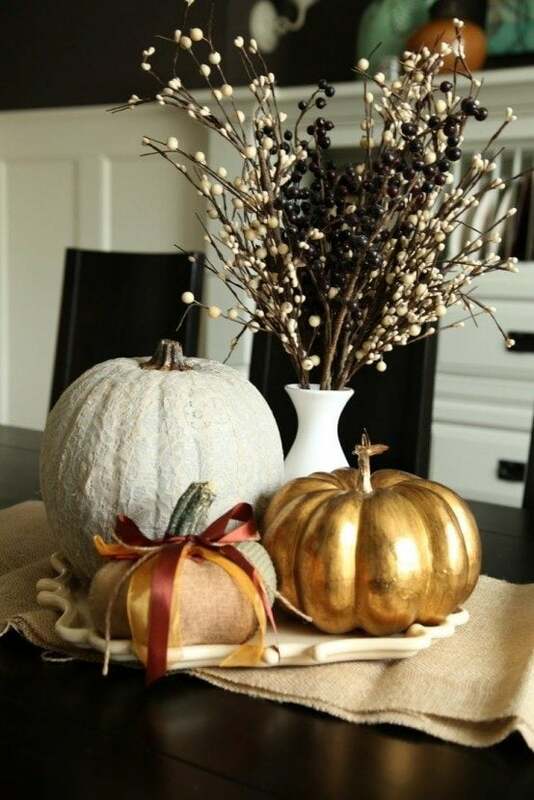 To us, this Thanksgiving centerpiece says “we like Thanksgiving, but we want to keep it comfortable-sophisticated.” This combination of black, white, gold and other soft autumn colors is a great color scheme with the dark table. This pumpkin wreath surrounding a white candle and topped with pistachios is one of our favorite Thanksgiving centerpieces. Sometimes the most elegant centerpiece is the one that relies on a strong, simple color scheme, and this is one of those times. Because you can never have enough glitter. Or can you? Depends. 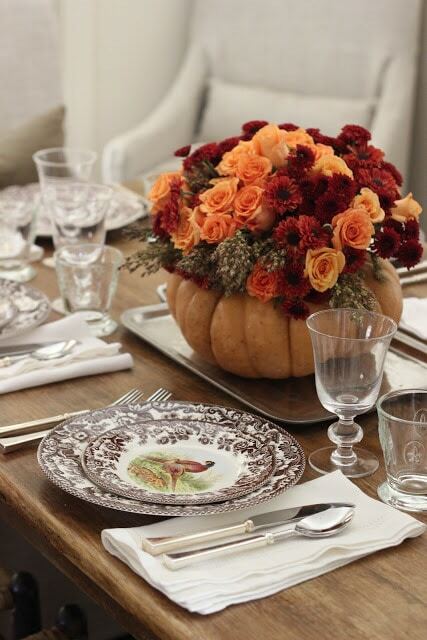 We love this cornucopia of Thanksgiving decorations. 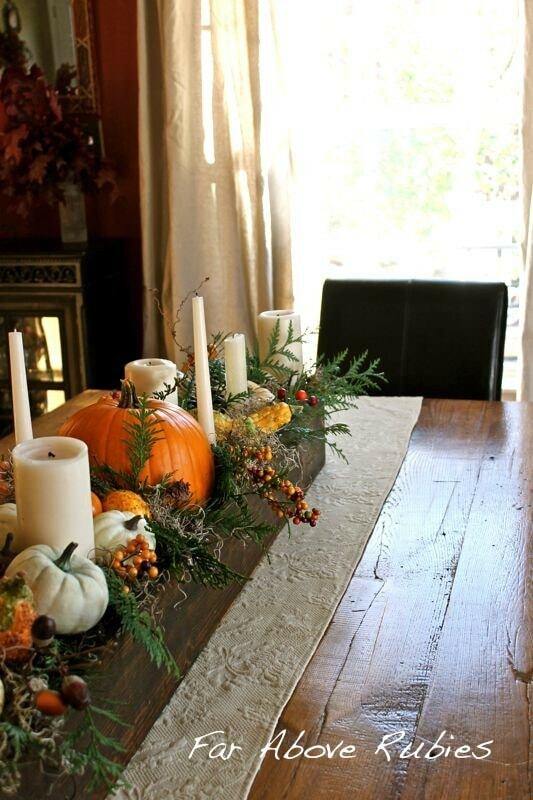 The stained wood box looks great against the table runner, which matches the cream color of the small pumpkins. 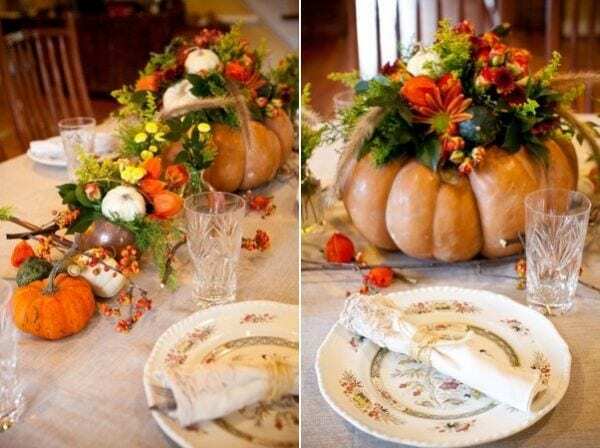 The small accents also match the large pumpkin and small gourds and such, and with the green filler, the whole thing looks so full and nice that it’s nearly guaranteed to ensure a good meal. Thanksgiving may be nearly a month after Halloween, but that doesn’t mean you have to ditch the black and orange scheme. 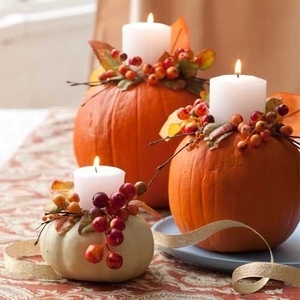 If you have a dark table, consider using an orange candle, leaves and decorative pumpkins to really make your Thanksgiving centerpiece pop. This is one our favorite DIY crafts for all year around take basic white candles and wrap something with burlap, twine or the like. It’s a great way to add a quick and easy flair, and Thanksgiving is the perfect time to bust out this versatile move. Use with a serving tray or plate to complete the look. 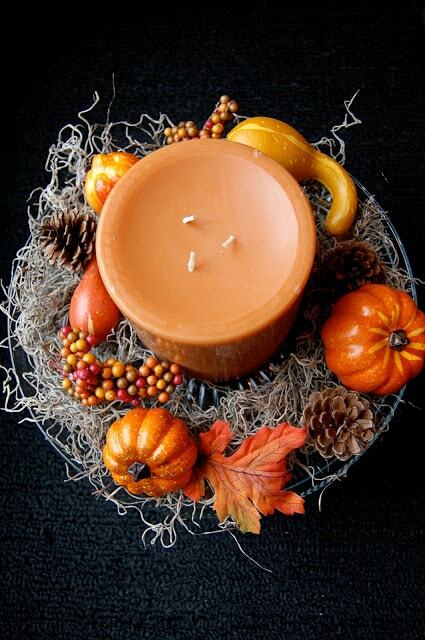 We love the brown and soft cream colors of this Thanksgiving centerpiece. 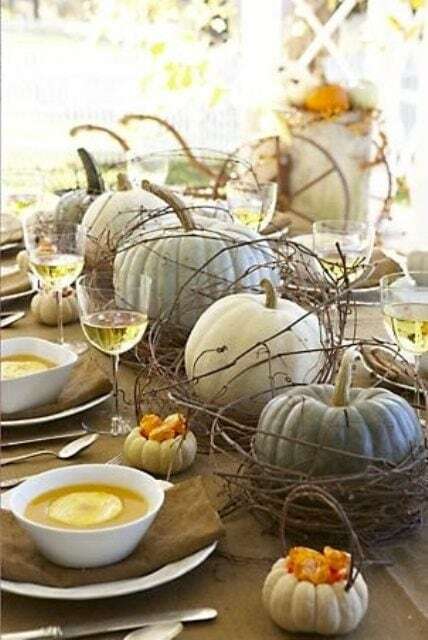 The pumpkins mixed with the natural brown of the sticks/nest material looks rustic and when the food and drink is on the table, the whole thing looks inviting. If you’re the type that likes to control where everyone sits, these pumpkin card holders are a great way to tell Uncle Joe he can’t sit at the head of the table. But you don’t have to use names, you can also use these as just as little reminder of the year, or if there’s something else going on – a wedding, pregnancy or such – you can use the placeholders to remind everyone that this time of year is special. 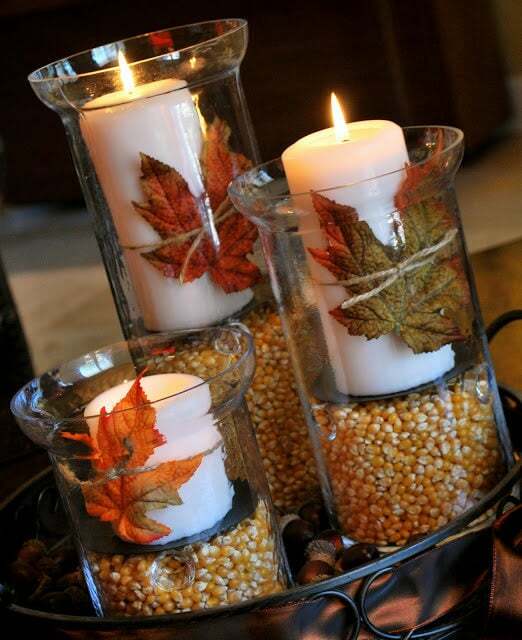 These wrapped candles take things a step further with the popcorn seed, something that at first may seem a little “poppy” but actually looks great with the white candles. The hurricane vases also do a great job of focusing on the shapes of the candles, and overall we love the look of the white, orange and dark of the centerpiece holder. As fan of the outdoors, we are by default fans of sticks. 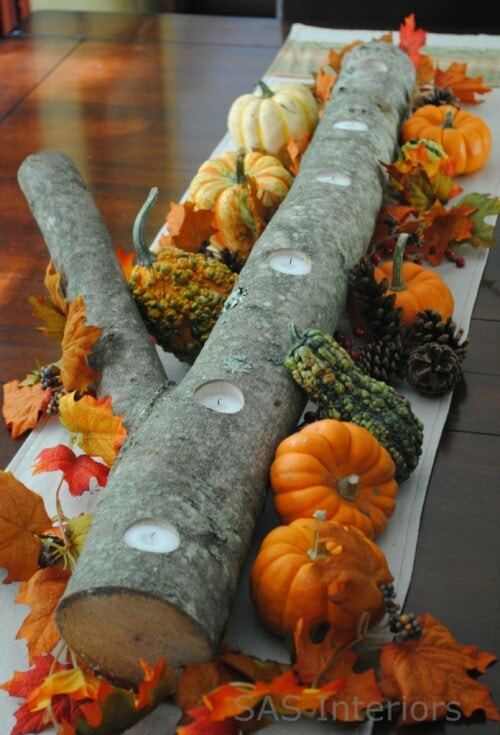 And these sticks look great because the natural wood-brown of the sticks contrasts greatly with the white pumpkins. With the dark background, it’s a wonderful color scheme, but even on a light wood table, this centerpiece would make an interesting, unique center decor. We are taught from a very young age that corn was an instrumental part of the history of Thanksgiving. And who are we to question history. 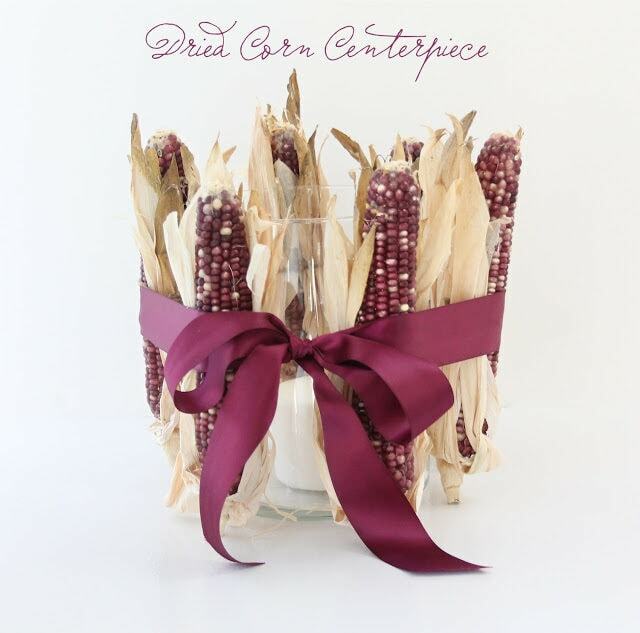 This unique dried corn centerpiece is unlike anything we came across, and it’s something we’re willing to try this year, assuming we host Thanksgiving. 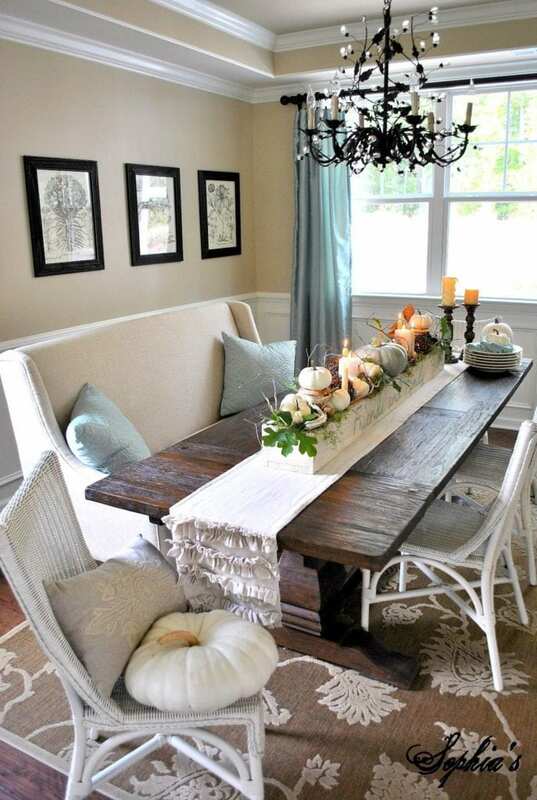 This shabby chic centerpiece seems like it would work throughout the fall and winter, but it’d also be great for Thanksgiving. For those homes that focus on whites and creams, this is a great way to keep your style while celebrating the joys and culinary delights of Thanksgiving. 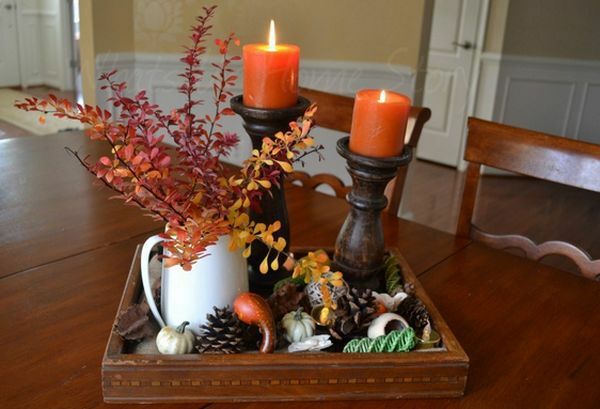 We were impressed with the nice, traditional look of this DIY Thanksgiving table decoration. The gourd is a great focus, while the spilling flowers and decor of the rest of the piece draw your eye toward the plates. This country chic centerpiece is rustic, full and vibrant. 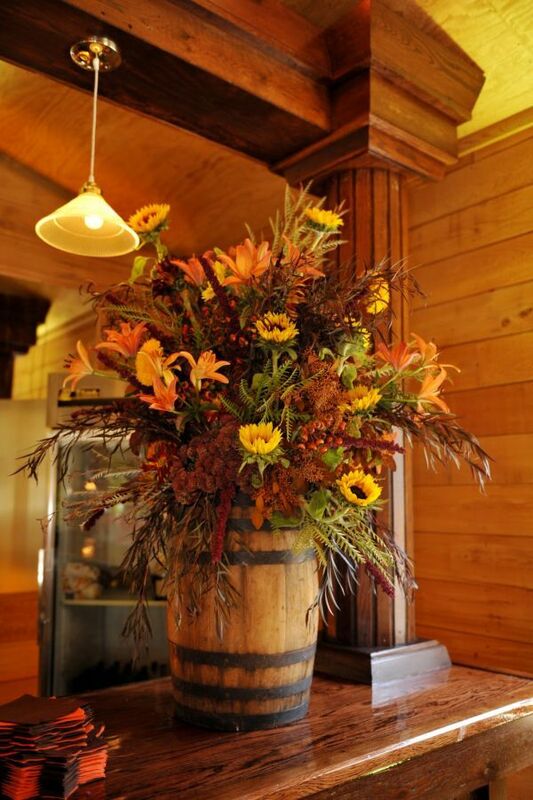 We love the way the barrel’s wood contrasts with the flowers, and the bright bouquet really brings the attention up and out toward the open space around the centerpiece. 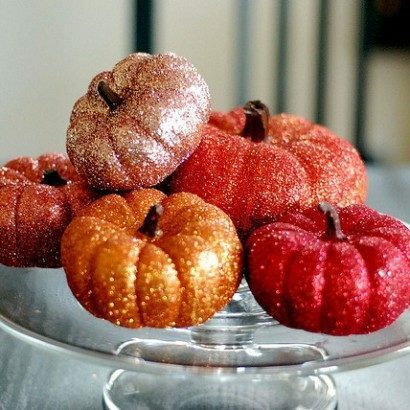 Pottery Barn Inspired Fall Decor. Remember that thing we said about liking the outdoors and so also liking sticks? The same goes for acorns. Or any nuts. These centerpieces are great for smaller tables that don’t need a whole lot going on. With just a few candles placed in the glass, you can have an elegant, comforting centerpiece that speaks volumes without being too loud. 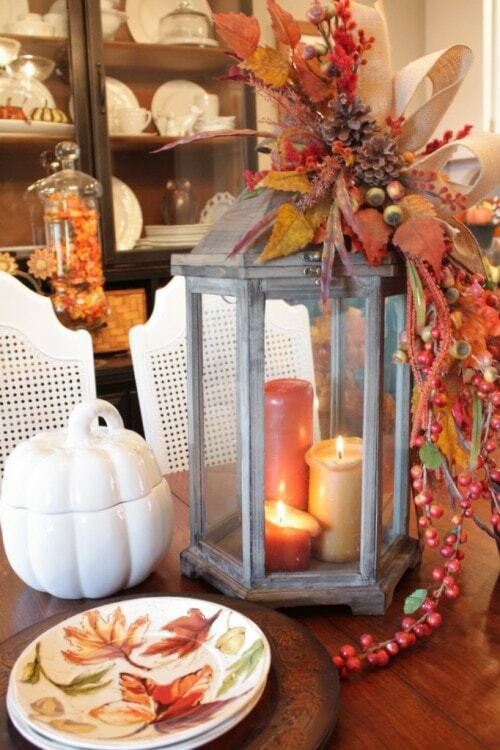 This Thanksgiving centerpiece allows you to get colorful – lots of different gourds can be used here – but the white candles and the white wicker basket bring it back all together. When we were kids, one of our favorite desserts was orange creamsicles, so it makes sense that we really like this table arrangement. It’s light, festive and tells people that the food won’t just taste good, it’ll look good too. This is just pure Thanksgiving in all its glory. 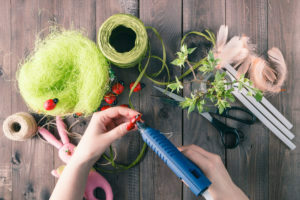 Nothing says you want to make a statement like cutting down a tree (or collecting it from a nearby wooded area) and putting it smack dab in the center of your table. If you’re handy with the power tools, you can dig little holes for the candles as you see here. As always, we are a fan of whites and cream colors combined with natural wood, burlap, and other darker materials, so this one’s a winner in our book. 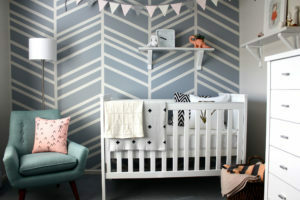 It’s simple, but detailed enough that visitors will question how long it took you to arrange. Don’t give them anything to work with. 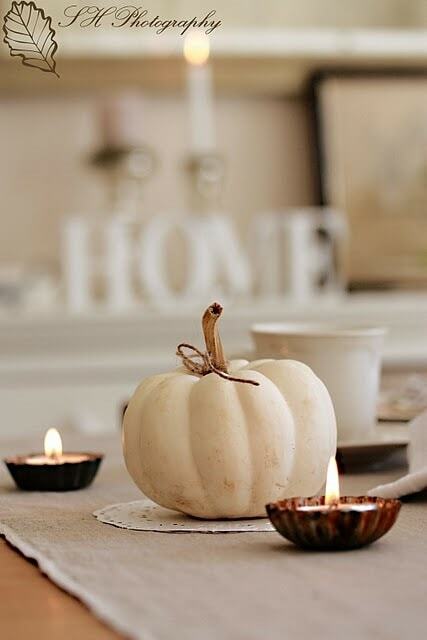 This Thanksgiving table decor is handy – should the lights go out, you can take this thing around the house looking for your friends and family to make sure everyone is accounted for. We just bought one of these things from Michael’s and will probably try out a variation of the above. If we do, we’ll update the post! These little beauties will give your arrangement some height, especially when you use the thin, long candles as you see here. We love the orange florals with the whites and cream-colored candles, and think is a gorgeous, yet understated piece to work with. 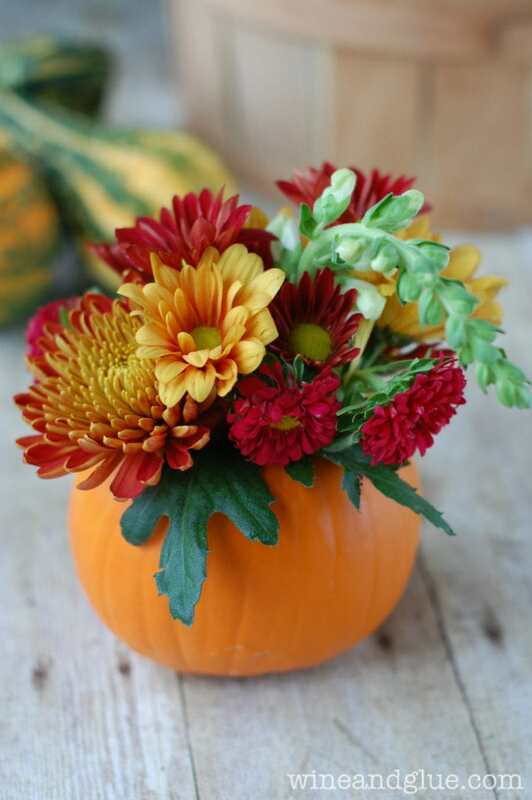 These bright, cheery flowers in the pumpkin remind of us of Charlie Brown for some reason. That’s a compliment, and you can learn how to make this pumpkin vase arrangement over at wine and glue. For the minimalist in your life, this wonderful centerpiece brings a touch of holiday spirit without being “all up in your face.” To us, this is something we’d find at Pottery Barn, then immediately take a picture of and try to copy at home. That’s just who we are. Compared to the other pumpkin vase, this one is a little more vintage-looking, and the floral arrangement uses nice, dark colors that accent the whites of the table. Love it! By now you can imagine that we like anything coming from the outdoors – sticks, acorns, wood logs – so let’s make this easy on all of us and put pinecones in that category. 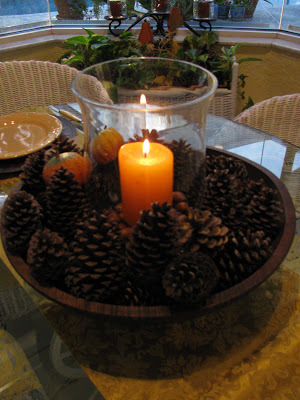 Pinecones not only bring a natural look to any centerpiece, but they also smell good (depending on their source) and you can find them all over the place if you’re in that type of location. Even if you’re not, you can always pick some up at your local craft store or pinecone store. 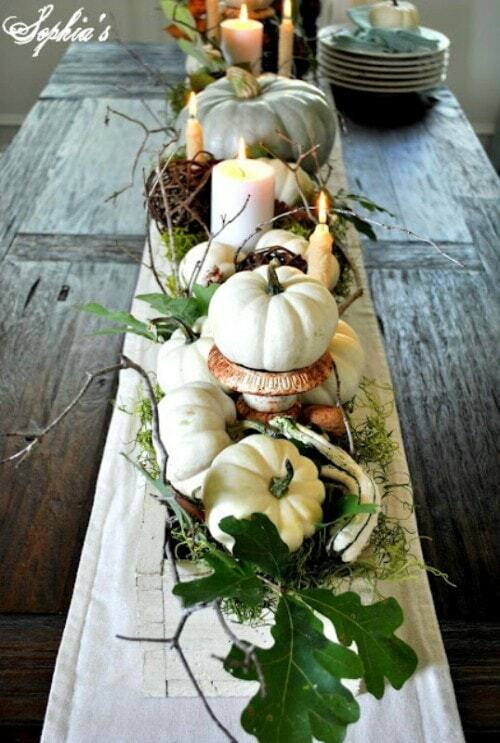 Combining pumpkins and gourds of different sizes is a great way to add depth and layers to your Thanksgiving centerpiece. 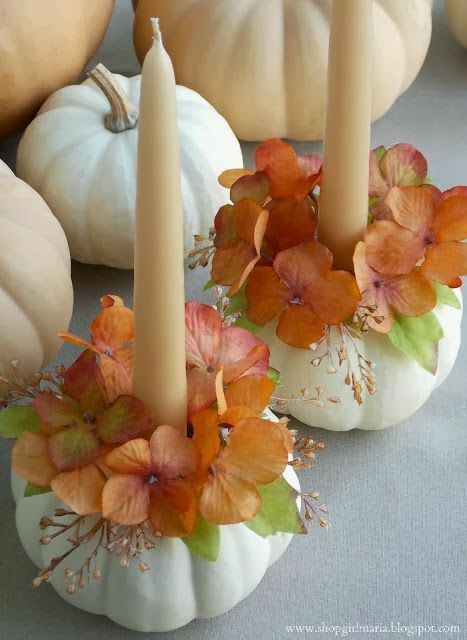 We love the candles sprouting out of these pumpkins and the sticks-and-floral arrangements on each one. …are the ones you come up with yourself. 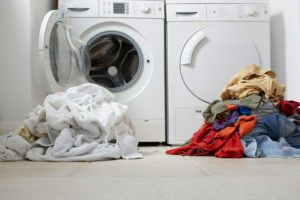 With these ideas, hopefully, we’ve sparked some deep, dark part of your holiday imagination that will come up with something that the world – or at least your family – has never seen before. 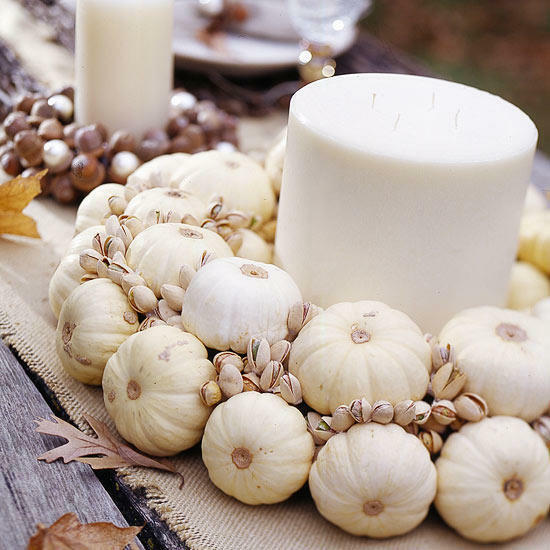 Whether you go for the simple cream-and-burlap centerpiece or the elaborate “I hope someone recognizes how much work went into this” centerpiece, we hope your Thanksgiving is as enjoyable as making these do-it-yourself table decorations. 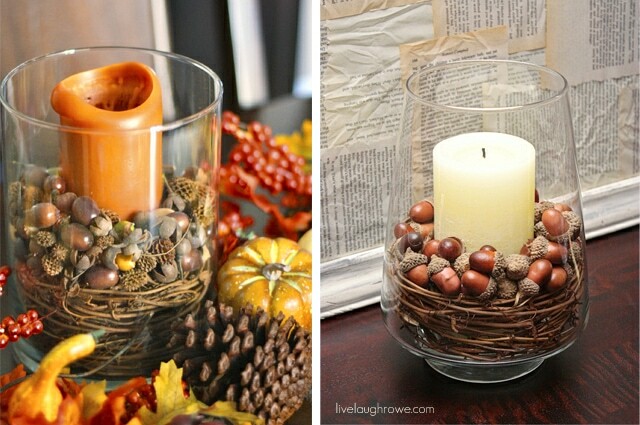 Which DIY Thanksgiving centerpiece has caught your eye?